During the weeks of fall course selection, many students at the University of Rhode Island are making mistakes without even knowing it. Incoming freshmen and rising seniors alike can become victims of delayed graduation if they do not know which classes they should be taking. Spooner believed he could still graduate in the fall, but when he went to file the paperwork he found that he was still short two 300-level classes. Spooner is one of many students at URI who are the first of their families to attend college. While this is an achievement for him, it can also present additional challenges. Often students are unaware of how complex choosing their schedule can really be, so they listen to friends’ advice and make decisions based on a generic form for enrollment. For one student, who asked to remain anonymous, her freshman year at URI the university dropped one of the student’s classes because too few students signed up right before classes started. Without that course, the anonymous student was left with too few credits to be considered a full time student. Though the anonymous student would recommend voicing concerns to the university college advisers, the student believes that every student needs to look into classes on their own carefully, as well. Walton advises that students should make appointments to see their advisers at least once per semester to discuss classes, and to come prepared with lists of questions and special interests so that they can benefit from the meetings. She advised that many people take classes that they think will fulfill credits for general education courses or their major that often do not. 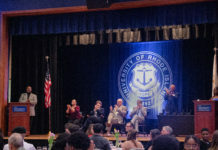 Spooner does not blame the advising department for his extended time at URI because he was very focused on getting his journalism credits at the time, leading to a simple oversight that he said he should have seen himself but was not equipped to.